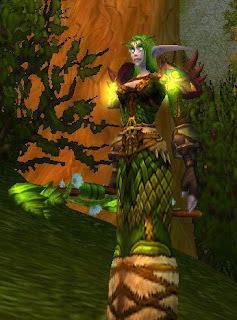 See my second transmogrification set for my balance/resto druid! It's very green. Kinda like the first one, but looks more.... grown up? She looks lovely and very druidy. I know, sniff, no matter what you do they grow up and move out into the cruel world! At least she isn't quite as self aware as your druid. Hehe. I'd go bonkers if all of a sudden she told me she wanted to be feral or something.